Opening Act: Jerry Brown disses Rick Perry, gay marriage in Illinois, Republicans want to delay Hagel vote. 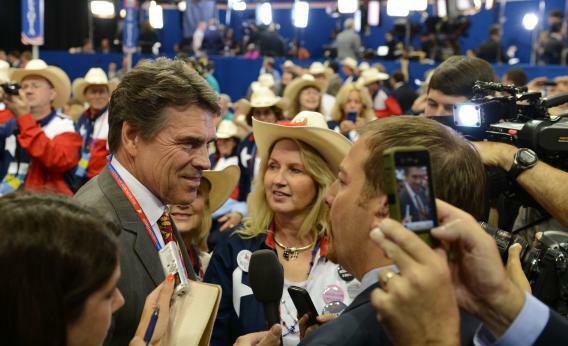 Former Republican presidential candidate and current Texas Governor Rick Perry speaks to the media at the Tampa Bay Times Forum in Tampa, Florida, on August 28, 2012 during the Republican National Convention. Jerry Brown gets the best of this inter-gubernatorial conflict. Gay marriage marches on in Illinois, one of those states where Democrats run every branch of the government and can push this through in a hurry. Sarah Kliff explains the health care portions of the CBO’s new “we’re doomed” report. On health care costs, we’re less doomed! Josh Rogin reports that Republicans want to delay the Hagel committee vote, seeking more of his post-Senate speeches and records—a standard tactic Democrats should have expected after Ted Cruz railed about it. Could we fix Congress by fixing the primaries?